Most varieties of apple trees are able to pollinate themselves, but you'll have a better, more regular harvest when you provide a second type of apple tree that allows successful cross-pollination to occur, according to the Colorado State University Extension website. 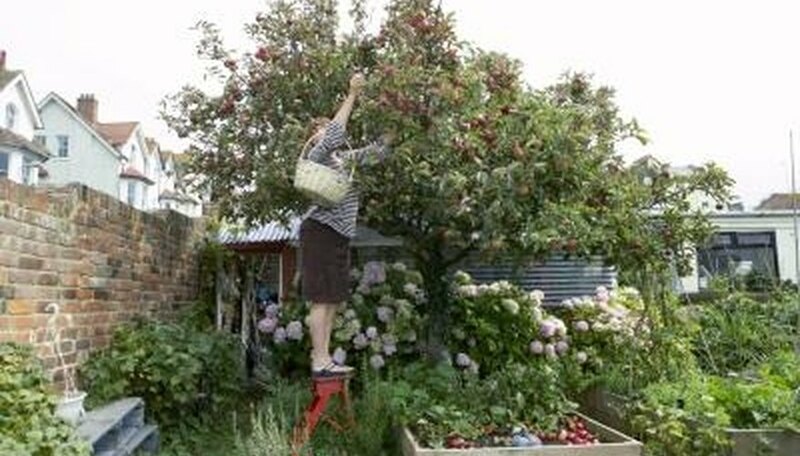 The term growers use for apple trees, and other fruit trees, that are capable of pollinating themselves is "self-fruitful." This variety is partially self-fruitful. When you grow a second apple tree in the vicinity of your Lodi apple, pollination is enhanced. Varieties that pollinate a Lodi apple include Braeburn, Fuji and Spartan, among others. The Lodi apple is an early-producing, soft fruit that ripens in mid-July. The fruits are yellow-green in color and medium-sized, with a sweet and tart flavor. Lodi apples make good applesauce. However, the fruit tends to split and become mealy as it matures and it does not store well, according to the University of Missouri Extension website. The Lodi is susceptible to the diseases known as apple scab, cedar apple rust and fire blight. It is helpful to introduce honeybees to the area where your Lodi apple tree is growing when the blossoms first begin to open in spring. Braeburn apples are partially self-fruitful; varieties that pollinate a Braeburn apple include Lodi, Fuji and Spartan, among others. Trees produce large red fruit that are firm with a "well-balanced" flavor, according to the University of Missouri Extension website. However, it is a late season variety, and the fruit stands a chance of not ripening before frost occurs in the fall. If your Braeburn apples ripen in time, they make good eating apples and they store well. The Braeburn apple is susceptible to the diseases known as apple scab, cedar apple rust, powdery mildew and fire blight. This variety is partially self-fruitful. Varieties that pollinate a Fuji apple include Braeburn, Lodi and Spartan, among others. Trees produce medium to large red fruit that is very juicy and has a high sugar content. It's a long-season apple, meaning that the fruit might not become ripe before frost occurs in the fall. They are good for eating fresh, and they store for a long period of time. The Fuji apple is susceptible to the diseases known as apple scab, cedar apple rust, powdery mildew and fire blight. This variety is partially self-fruitful. Varieties that pollinate a Spartan apple include Braeburn, Fuji and Lodi, among others. Known as the orange pippin, this small, heavily producing apple ripens in October and is in the McIntosh family of apple varieties, with snow-white flesh. It's a Canadian development and is a cross between the McIntosh and Newtown pippin varieties. The sweet, crunchy fruit is good for eating fresh, applesauce and other processed uses such as juice and freezing. Spartan apples store well for a long time. The Spartan apple shows some resistance to the diseases known as apple scab, fire blight and powdery mildew. However, it can suffer from bacterial canker in damp climate zones.